Kyle Haines’ return for the 2015-16 ice hockey season has been confirmed by Fife Flyers. The club’s captain and key defenceman will be back at Fife Ice Arena when the season gets underway at the end of August/start of September. He was one of the stand-out, and most consistent, skaters in a frustrating 2014-15 campaign, and his approach fits with the coaching staff’s desire to build around players with a strong work ethic. 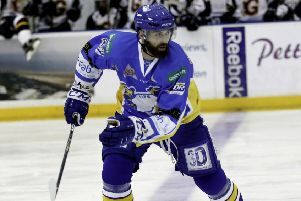 Haines said: “I’m really excited to be back and help lead the Fife Flyers to a winning season. It’ll be his third season in Kirkcaldy, and he will return to a new-look side. Enforcer Matt Nickerson and forward Ned Lukacevic have gone to Belfast Giants and Coventry Blaze respectively, and more faces from last season will be non-returnees as Todd Dutiaume, head coach, and Danny Stewart ring the changes.